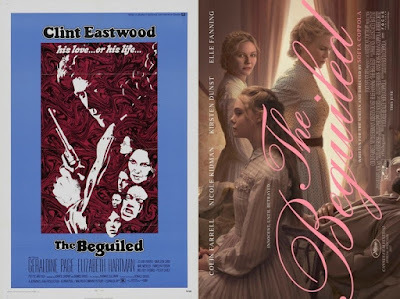 On this episode film critic Alice Bishop joins us at the lovely Civil War era bed and breakfast as found in the 1971 and 2017 film version of THE BEGUILED. We discuss the differences in seeing Colin Farrell and action and western icon Clint Eastwood in a state of vulnerability and how one increases the horror of the situation in these similarly plotted films. The accusation of whitewashing in the new Sofia Coppola version is discussed as is the different interests between her and the original's director Don Siegel. All in all its a lovely time where we exchange mushroom recipes. ALSO: Our friendship survives a minor disagreement on the merits of Blake Lively in shark flicks.